Diane Maguire, north district senior programs coordinator for the Salvation Army, says a new book club is bringing seniors together. 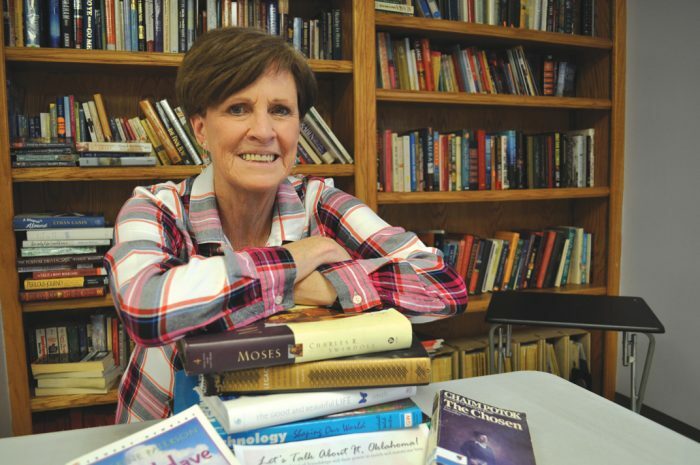 A book club series offered by the Salvation Army is helping bring seniors together. Diane Maguire, Senior Programs Coordinator, North District, began the book club last year that met once a month and brought in various scholars to discuss what participants would be reading. “The group that was involved was very interactive,” Maguire said. This is the second offering for the Salvation Army. The initial group wrapped up in November. In December, the Salvation Army Central Oklahoma Command announced that it will host Let’s Talk About It, Oklahoma!. The series of reading and discussion programs are made possible through a grant from Oklahoma Humanities with generous funding from the Inasmuch Foundation and the Kirkpatrick Family Fund. The Salvation Army’s Warr Acres Senior Center, 4301 N. Ann Arbor, will be the venue for the five-part series, Friendship. The series will explore the subject of friendship and its power to enrich and sustain our loves. The titles in the series include: Jacob Have I Loved by Katherine Paterson; The Chosen by Chaim Potok; The Color Purple by Alice Walker; Turtle Diary by Russell Hoban; and Recovering: A Journal by May Sarton. The first reading and discussion group is set for January 17th from 9-11 a.m. with Harbour Winn leading the discussion of Jacob Have I Loved. Participation is free, however seating is limited. The Salvation Army Central Oklahoma has been serving the elderly population for more than 50 years. There are currently four senior centers in the Oklahoma City metro area serving approximately 350-425 seniors each week. The centers are open to anyone age 55 or older, free of charge. Wellness activities, lunch, Bible study, and reading and discussion groups are all a part of the current programming taking place. The mission of Oklahoma Humanities (OH) is to strengthen communities by helping Oklahomans learn about the human experience, understand new perspectives, and participate knowledgeably in civic life. OH is a private 501(c)(3) nonprofit organization. As the state affiliate of the National Endowment for the Humanities, we strive to stimulate discussion, encourage new perspectives, and to actively engage people in the humanities disciplines such as history, literature, philosophy and ethics. The mission is to preach the gospel of Jesus Christ and to meet human needs in His name without discrimination. Nearly 183,000 Oklahomans receive assistance from The Salvation Army Central Oklahoma each year through the broadest array of social services that range from providing food for the hungry, relief for disaster victims, assistance for the disabled, outreach to the elderly and ill, clothing and shelter to the homeless and opportunities for underprivileged children. About 83 cents of every dollar raised is used to support those services. For more information, go to www.salvationarmyokcac.org. The Salvation Army Central Oklahoma Area Command is a proud partner agency of the United Way of Central Oklahoma.